This past weekend when my in-laws were in town, I wanted to make something good. I think the pressure to impress has stayed - well, that and I love to cook something delicious for company. You HAVE to try this! It's light, but filling. It's colorful and healthy. You can go without the steak to make it vegetarian and you could even add more veggies. It's definitely a keeper. While pasta cooks, rub steak with 1/2 the cumin, salt, and pepper. Grill 4-6 minutes, turning once for medium-rare. Put peppers, corn, and onion on the grill as well for 8-10 minutes, until lightly charred and tender. Turn as needed. As food is cooked, move it to a cutting board. Let steak rest 5 minutes before cutting. Cut peppers in bite size pieces, cut corn off the cob. Add all vegetables to pasta bowl, including tomatoes. Slice steak thinly across the grain and add to the bowl. While pasta cooks, thinly slice raw steak against the grain. Coat with cumin, salt, and pepper. Heat frying pan and oil in a pan. Add steak to the pan and cook on medium-high, turning once, until your desired tenderness. If you have a lot of steak to cook, do it in batches. Turn on broiler. Slice and dice peppers, onion, tomatoes, and corn off the cob (omit corn if using canned). Lay out all vegetables in a single layer in a large cookie sheet. Drizzle with olive oil, salt, and pepper. Broil, keeping and eye on them. You want the vegetables to be soft and just browning. When you see the tops of the vegetables browning, stir and spread out in a single layer. Let them broil for about another 5 minutes. 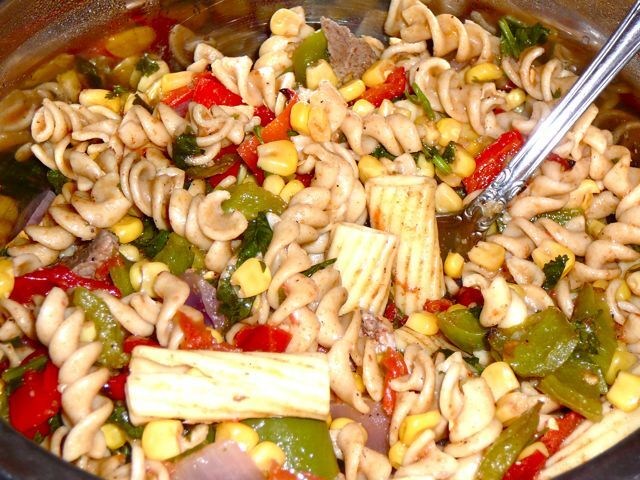 After steak and vegetables are done, mix into pasta bowl. Add drained can of corn to pasta bowl as well. Add olive oil, lime juice, cilantro, and the rest of the cumin, salt, and pepper. Toss to mix and coat. *Note: you can grill the tomatoes or put them in fresh with the mixture. This recipe is good warm and cold. YUM!